The past few weeks have been full. End-of-the-school-year, hustle-and-bustle-of-summer, answer emails, market books, clean-clean-clean. I’m not going to lie. The writing suffered. And when the writing suffers, the inner voice screams. And when the inner voice screams…well…I feel like I’m faking this whole I’m-a-writer thing. So, I got away. 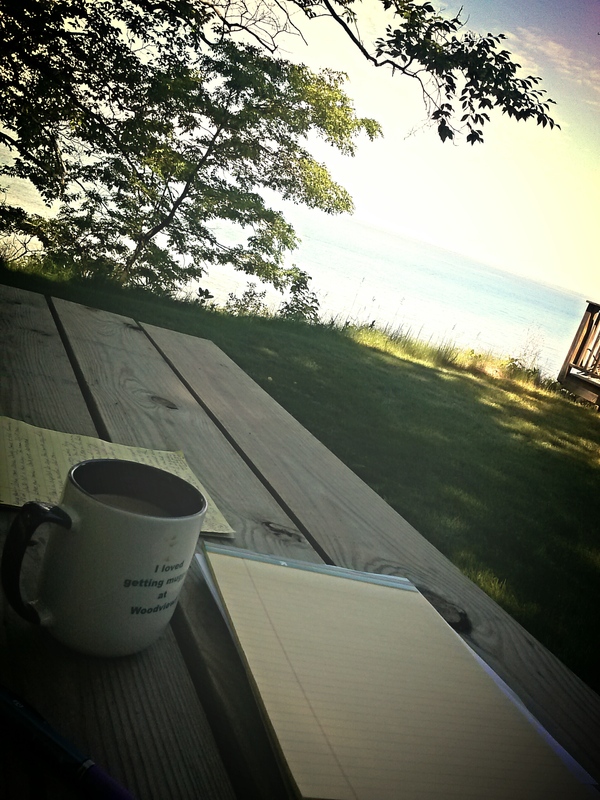 Grabbed my yellow legal pads and purple pens and first draft and took off to a cottage on Lake Michigan. 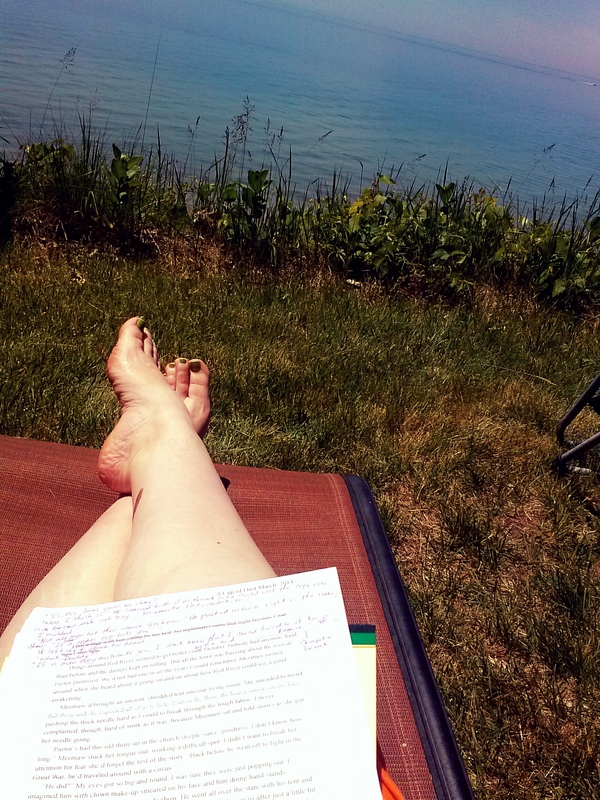 A lot of the time I scribbled away on my manuscript to the sounds of a ticking clock, coffee pot brewing, and the waves of the Big Lake. The writing thrived. I figured out connections between plot points (basically, a game of connect the dots between important events in the story). I worked out some characterization issues (who are these pretend people???). I tightened prose (fixed up the words). And I grew a deeper love for this story. I remembered that I love this job. I love this story. And I really do love my characters (yes, even the bad guy). It’s amazing what a little sun and waves will do for a girl. What would you do if you could get away for the weekend? Who would you take? Where would you go? Have you ever had an amazing get-away? I love to hear from you! ← I Think I Want To Be A Writer…Now What? And Other Writerly Questions. One of my favorite places to be, and you had a beautiful weekend to be out there! Glad you got a lot done!!! Retreats are amazing! I love it there, too, Debra! So thankful to have a place to get away! Oh…oh..I have to ask…were there ladybugs on the beach? I didn’t see any. That happens more in the fall. 🙂 But there were ants in my pants. Literally. I was sitting on an ant hill. They weren’t amused. You know, I had to acquire a love for it. I’ll have to bloggy blog about it, I guess. And if you throw the whole thing out, I’ll find you and give you a severe scowl. Don’t think I won’t. Wow. Sounds amazing. I need to do this! I am living the busy life right now. Though my “getting away” might be staying up writing late friday night/ Saturday morning,I’m hoping for a weekend like this soon. Keeping going Susie, you inspire us all! Bob, It was amazing. The thing that really amazes me, though, is that I’m still riding the wave of momentum. Weekends like that are a restart for me. But so are the late night Friday/Saturday morning sessions.